IIM Indore IPM Application Form 2016: Indian Institute of Management (IIM), Indore invites eligible candidates to apply for the IIM Indore IPM Admission 2016. So the candidates are advised read the official notification carefully before applying for the IIM Indore IPM Aptitude Test 2016 for admission to the Five Year Integrated Programme in Management. 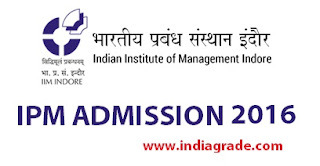 You can all the procedure regarding the IIM IPM application form 2016 from our indiagrade.com website. If you have any queries about applying for the IIM Indore IPM admission form 2016, then you can contact Indian Institute of Management Indore (Phone: 0731 2439686 / 24396687 & E-mail: ipmadmissions@iimidr.ac.in) otherwise you can leave a comment below. The process of IPM Registration Form 2016 is already started now and the candidates should complete the application form process before the last date of the submission. Candidates will not able to apply for the IPM IIM Indore Online Application Form 2016 after the closing date of the application submission. We advised you to don't do the IPM application form 2016 at the last moment because there may be a chance of heavy traffic in the website. So You can apply for the IPM Indore application form 2016 two days before the last date of submission. For General & NC-OBC Catrgory: Applicant should have 60% in SSC and HSC or equivalent. They must attain 20 years of age as on 31st July 2016. For SC / ST & DA Category: Applicants must have 55% in 10th & 12th class and they should attain 22 years as on 31st July 2016. You should open the official website by clicking the link available below. Click Apply Online button the page and start filling the application form. You should have scanned images of the Passport sized Photograph and Signature as per the prescribed format. Complete the first step to generate the username and password. It will be sent to you through the SMS & Email. The login into the website using the details and proceed the payment process. Payment will be done by the SBI Collect method. Then enter the payment details to complete the IPM IIM Indore application form 2016. When registrations will start ?? Can a non math student register for ipm? Can 18+ years of age can apply? As it's written, eligibility for IPM is to attain 20 years of age.